Geoffrey & Adriana will assist with adjustments and modifications so everyone can enjoy this flow no matter what level you are!!! Our meal together will finish around 12:15- 12:30. 1. Mountain Biking Sedona has some of the best trails in the world. Bobby will ride along for several rides. 2. Vortex Hiking in the Red Rocks Adriana will walk along for the vortex hiking. 4. Art Gallery Tours Dana Kjellgren, one of our yoga teachers who is active in the Art Community of Sedona will lead the tour. This is included in the cost of the retreat. 5. For those interested in Native American Culture and Archaeology, there two sites I can recommend; Montezuma Castle and Tuzigoot. These are both National Monuments that celebrate the Pueblo culture of the Southwest. 6. Massage will be available (booked in advance) but not included in the cost of the retreat. One of our top choices is Nicole Wilson enterzennow@gmail.com 928-592-2395. Nicole charges $75 for an hour of luxurious massage and will come to your room. Our last day will be Friday May 3 at 9:30 AM. We will meet at the entry gate to Rachel's Knoll at 9:30 am. Guests should car pool to site. Entry fee is included with cost of retreat. Professional photographer, Robert Clarke will be on hand to take group and individual photos. A download link will be sent to everyone. This is included in the cost of retreat. There will be one Restorative class on Thursday afternoon from 4pm -5:15 pm with Crystal Bowls. Restorative yoga is included in the package. If there is interest an additional restorative class will be added. Dinner will be on your own. However, guests may choose to dine together. We will provide a list of the best restaurants in Sedona with their website The restaurants provided offered Vegan, Vegetarian/ Non-Vegetarian cuisine. 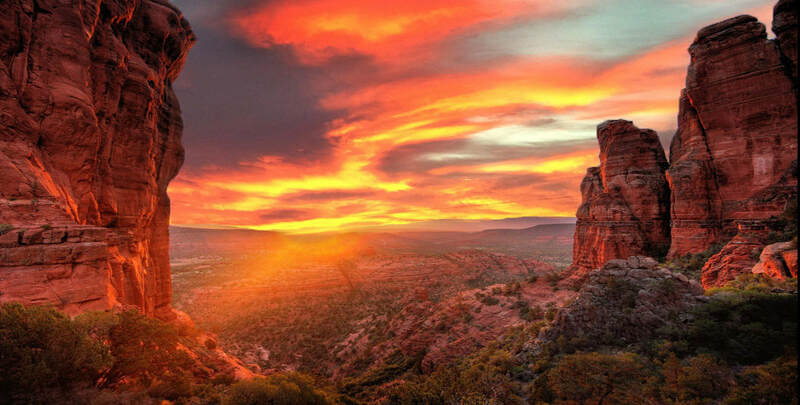 No matter where you stay you will have an amazing time in Sedona!! 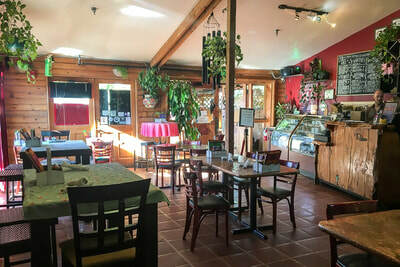 The Local Juicery https://www.localjuicery.com "Love Your Body Feed Your Soul"
Retreat is limited to 15. Sorry, no refunds after April 8th. Credit can be applied to next retreat. Going Deep with Yin Yoga. Yin Yoga has it’s roots as part of the original Hatha Yoga tradition. Yin combines the influences of Indian Yoga with Chinese Daoist Yoga to improve our health on many levels. Most forms of yoga today are dynamic, active practices designed to work only half of our body, the muscular half. Yin allows us to work the other half, the deeper tissues of our muscles, ligaments, joints and our bones. Yin mobilizes and strengthens the joints, facia and connective tissue. The emphasis is on long-held poses. Generally most students can do Yin. Different levels of the poses are used during the sessions. Props are an important part of the Yin practice. Therefore we use blankets, bolsters, blocks, sand bags, and straps. Props help the practitioner surrender to gravity in long held poses. This is the magic ingredient, holding the pose for 3- 5 minuets. Yin yoga involves the Parasympathetic nervous system which restores body to a state of calmness. By doing this the fascia tissues have an opportunity to lengthen as space is created with the breath and the pose. After a Yin practice the body feels deeply relaxed as if the practitioner just experienced a deep tissue message. Yin yoga can also help the student find deeper expressions in the Vinyasa -flow practice. Integral Yoga, exercise science and evolutionary biomechanics, Integral Theory and philosophy, the Yoga Sutras, Tantric science, and neuroendocrinology as these topics relate to the beautiful practice of Vinyasa Yoga, with particular regard to Ashtanga Vinyasa Yoga. The overall effect is to help students build their own liberating practice unique to their own path and progress and to keep practicing as life unfolds. In the Restorative Yoga portion of the session, you will be guided into supported poses on the floor through demonstrations by the instructor and individual attention to help you relax into the most comfortable version of the poses for you. We will use blankets, bolsters, blocks, straps and sandbags to help the body release muscle tension and relax deeply. If desired, the instructor can also provide hands' on adjustments to facilitate deeper release which may include Reiki, as the individual chooses. Our goal will be to provide you with the opportunity to experience a sense of peace and relaxation difficult to attain in the normal circumstances of our lives. We will finish the session with Yoga Nidra, a guided meditation practice which is led by the instructor as you relax in stillness in Savasana or a supported relaxation pose. You have only to listen and follow the instructor's voice to access a deep state of consciousness between waking and sleeping where you can bring your chosen intention to fruition. Yoga Nidra is an ancient yogic practice that is being used widely today to help first responders and military veterans deal more effectively with Post Traumatic Stress. It is also very beneficial for addressing the negative patterns that most of us deal with in our lives and can help to bring about a deep sense of peacefulness and well-being. Vibrational sound healing can be traced back from present day trends to many ancient civilizations including India, Africa, Europe, and the Orient. Everything in our Universe is made purely of vibrations. The human body and the entire earth are made up of energy, vibrating at different frequencies. When out of rhythm, disease and disharmony result. Therefore vibrational sound healing addresses these imbalances or blockages of the energy channels. Ancient religions and modern sciences agree that our Reality is an ocean of living energy, and that all matter (such as a human being) is simply interpenetrating waves of energy which have crystallized into form and structure. Crystal Bowls work directly with universal energy and channel it into the body to enliven our entire being. Yoga has been a life- long journey for me. I was first introduced to yoga in 1967 while living in Laguna Beach, CA. This was during the height of a progressive movement in the United States. After reading Autobiography of a Yogi, I was inspired to practice yoga and meditation. As I practiced, I felt it became more of a spiritual experience. The asanas provided Moksha (liberation) of the mind, compassion to the soul and health for the body. I received my 200 RYT training in 2011. Teaching yoga at Sattva in Escondido and learning from Rached Malouff was a blessing! About nine years ago I started practicing Yin Yoga and I could see the benefits it provided. Bernie Clark, world renown educator/author, trained me to teach Yin Yoga and I received my certification to teach Yin in 2014. I was also fortunate enough to take Ashtanga Yoga classes with Tim Miller, a master teacher, who gave me kindness and inspiration. Additionally, I am inspired by the teaching’s of BKS Iyengar which are my absolute favorite. He emphasizes that each asana is meditation. 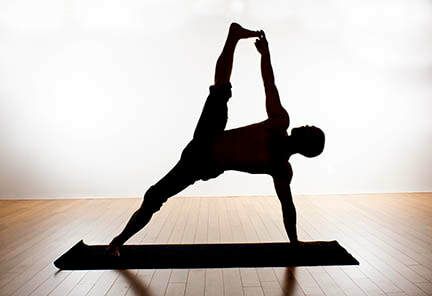 Using your whole being in the pose has helped me to understand the real meaning of yoga. As I continue to study the Iyengar method of yoga, I feel that I will be a student for life. I look forward to my up coming training with Tias Little, who studied in India with the master BKS Iyengar, which will deepen and enrich my practice. The teachings of Thich Nhat Hanh gives the wisdom of enjoying each moment by being in the present. "To live spiritually is to live in the present." I bring this thought to class when I teach yoga. I find that it helps my students focus on the breath, alignment and posture. Yoga can provide insight to all of us. My favorite cue is to cultivate Sukha (happiness, comfortable) and Sthira (calm, steady) in asanas. Listening to the body and your inner self will ensure a safe and fulfilling practice. Teaching and practicing Yoga is my ultimate love. To share with others brings me compassion and peace. Dana's primary focus as a yoga teacher has been to support wellness, promote peace, and to encourage an opening into a deeper spiritual awareness. Her belief is that yoga is for everyone and she strives to make students feel welcome and safe in classes, offering modifications of poses in order to make them accessible to all. After 40 years of practice, and studying with teachers from several lineages, she trained to teach yoga, completing a basic 200-hour program, and began teaching in 2010. To go deeper, she completed the 300-hour Advanced Teacher of Therapeutic Yoga training with Integrative Yoga Therapy at the Kripalu Center for Yoga and Health in 2011-2012. Dana has completed separate trainings in Restorative Yoga, Yoga for Back Care, Yoga for Seniors, and Yin Yoga, among others. In 2014 she trained to teach Mindfulness Based Stress Reduction with U.C. San Diego's Center for Mindfulness, a program of UCSD's Center for Integrative Medicine. She generally adds elements of mindfulness training and Mindful Self Compassion to her yoga classes . Dana is also a Reiki Master-Teacher. 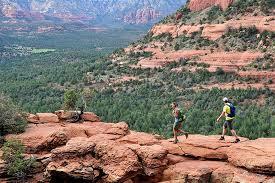 There are many great activities to plug into in and around the Sedona area, many of them free or for a small fee. We have included some of them in our retreat program such as a gallery tour, guided vortex hikes and mountain bike adventures while others you can do on your own. Here are a few activities we think are worth exploring. If a great massage is what you are looking for we suggest Nicole Wilson. Nicole began studying yoga philosophy as a teenager and at age 18 became a Certified Yoga Instructor through the Sivananda Yoga Ashram. She graduated from the Arizona School of Integrative Studies in 1999 and later went through their Massage Teacher Training program. She also has studied Reiki and various styles of martial arts and dance. Buddha of Limitless Light, whose bronze image is nestled in the faceplate of the stupa. ​all beings. Sedona is an International City of Peace. 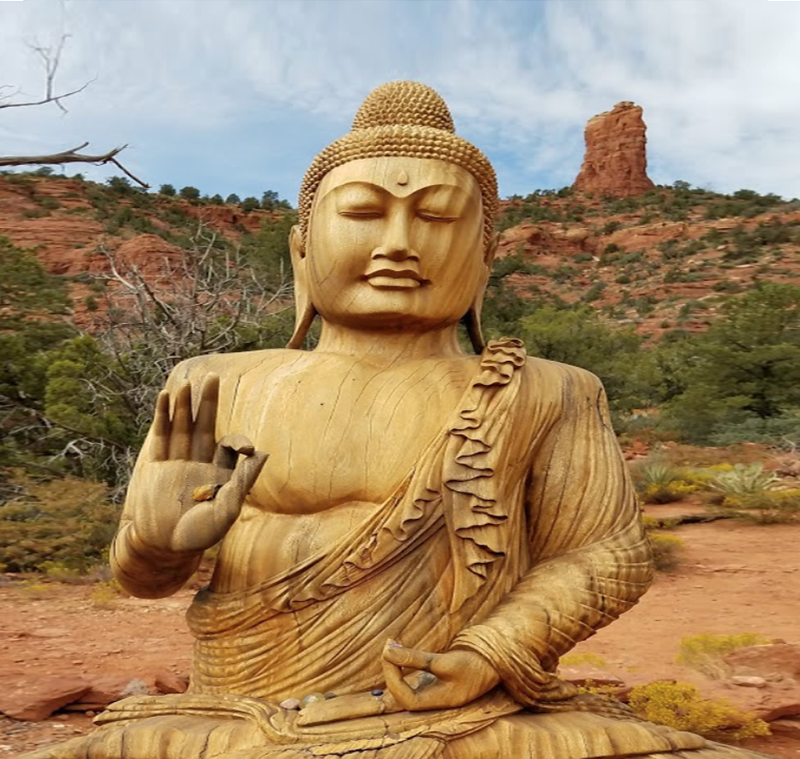 There are many beautiful spiritual sites in the Sedona area. Sedona’s spiritual heritage extends far earlier. For thousands of years Native American tribes that inhabited the Sedona-Oak Creek Canyon area have use the land for sacred purposes. 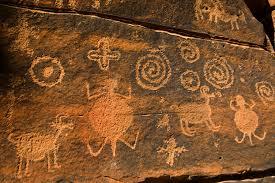 In fact the Anasazi (“the ancient ones”) did not live in Sedona, they lived outside. They considered Sedona a sacred area and used the area for ceremonies. To this day Yavapai Indians make a yearly trip to Oak Creek for a cleansing bath, similar to yearly pilgrimage to the Ganges made by the Hindus. The term “vortex” is more symbolic than literal. Most vortex energy sites do have a circular energy flow. They are areas of enhanced linear energy flow.Vortexes are energy flows that exist in dimensions deeper than electricity and magnetism. This may sound mystical and it is! It is also based on the latest in science. At vortex sites the energy flows in deeper dimensions. If you are interested in reading more about the vortexes of Sedona, check out Pete A. Sanders book "Scientific Vortex"
I have three favorite vortex hikes I would like to offer for our retreat. Below are brief descriptions of each. ​Red Rock Crossing to experience the Inflow of Cathedral Rock. This hike is easy/short about 3 miles loop. There is no significant elevation gain. With an added benefit of walking along the Oak Creek pass Buddha Beach. This hike will be the offered Tuesday 4/30 at 1:30. All of our rugs are woven by Navajo weavers, most of whom live traditionally on the Navajo Reservation located across Arizona, New Mexico, and Utah. From the inception of weaving by the Navajos around 1700, weaving has provided an important economic benefit to the tribe and a fine outlet for their artistic talents. Their rugs are made in the weaver's home or hogan on vertical looms using the same methods they have used for the past three hundred years. Native American and Southwest Fine Art & Jewelry. This is truly a gem of Sedona! This gallery is located in Tlaquepaque Arts and Craft Village. Honshin is a master artist with a unique and ascending spirit that comes through in his art. 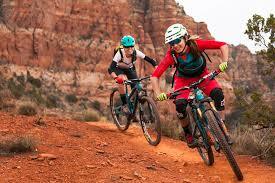 Mountain bike enthusiasts from around the world come to Sedona to ride the red rock trails in and around Sedona. Local photographer and mountain biker Bobby Bretell will riding with you on some of his favorite trails. The trails will be for beginning to intermediate levels. Bring your bike or rent a bike from several bike shops in Sedona or the Village of Oak Creek. Below are listed bike rental shops in Sedona and the surrounding area. About 20 miles outside of Sedona on a hillside lies the old mining town of Jerome. Jerome is a historical town in central Arizona. The Mine Museum explores Jerome's history as a booming copper-mining town. Jerome State Historic Park is home to Douglas Mansion, built in 1916 by a mining mogul James “Rawhide Jimmy” Douglas on a hill, overlooking his Little Daisy Mine. Another site to see is the Audrey Head Frame Park which has a glass viewing platform over a 1918 mine shaft. 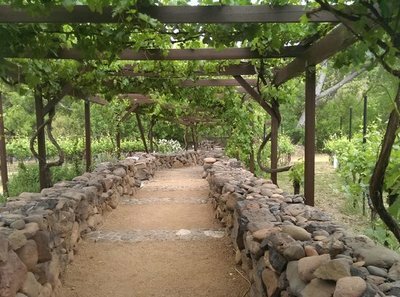 Art galleries and small wineries dot the downtown area. To the east, Tuzigoot National Monument, preserves an ancient hilltop pueblo. Montezuma's Castle is one of a number of well-preserved ancient dwellings near Sedona, including the Wupatki, Tonto, Walnut Canyon, and Tuzigootnational monuments. It is probably the most spectacular; an imposing 20 room, 5-story structure built into a recess in a white limestone cliff about 70 feet above the ground. When first (re)discovered the ruins were thought to be Aztec in origin, hence the name bestowed on them by early explorers, but they are now known to belong to the Sinagua Indian peoples who farmed the surrounding land between the twelfth and fourteenth centuries, before abandoning the area. The good state of preservation of the ruins is due in part to their protected location, shielded from rain and sun, and also the relatively early designation of the site as a national monument (in 1906). Sedona Sacred Rocks, formerly a Buddhist Retreat Center, rests on two secluded Red Rock acres adjoining two thousand acres of the Coconino National forest. 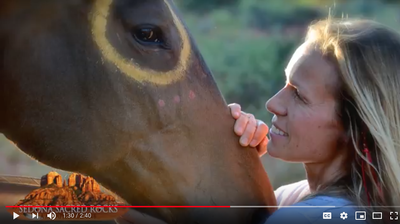 owner, Meaghan McCue has offered horseback riding to guests of the yoga retreat. Cost is about $75 and would need to be booked in advance on their website, sedonasacredrocks.com. 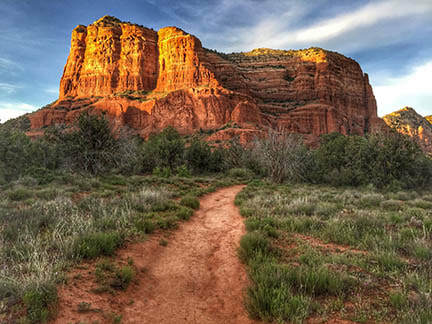 Sedona Sacred Rocks is located 7 minutes from downtown West Sedona.